Inspired by his father making some science projects, Nikky Kumar Jha, at just 6 years of age, was curious to know ‘How Stuff Works’. And the process of questions popping up in his mind would give him sleepless nights. He was curious on how man and machine interact, how machine gets connected to other machine, how machine gets connected wirelessly, what are the protocols that machines follow. Being born and bought up in a small village named Naya Tola in Bhagalpur, Bihar Nikky lacked resources that could answer his quests. Nikky says, “I was not having proper internet connection but as they say, ‘Books are men’s best friends’, I applied it.” He started reading books of physics by authors like David Halliday, Robert Resnick, Jearl Walker which evoked in him the love for Science, especially physics. 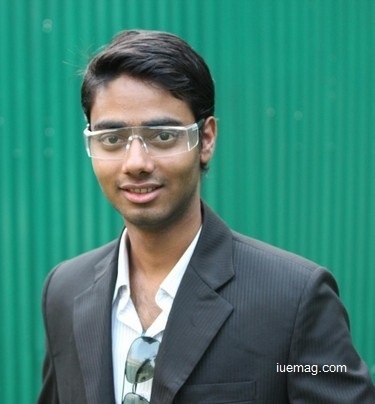 “Looking at my increasing passion towards physics, my father ordered magazines like Vigyan Pragati, Science Reporter and Aavishkar and I became the regular reader of this magazine which kept me updated about the technologies,” mentions Nikky. Not only the family but also his schooling played a prominent role in motivating him towards being a person passionate about Science. He used to bunk literature and arts classes and utilise that time for his interest in the physics and chemistry experiments and his inventions for the Science Fair in which he stood as the district and state topper throughout School. At a tender age of 14, Nikky was awarded the title of Jr. Scientist by NCSTC NETWORK (Govt. of India), a wing of DST (Department of Science and Technology) which inspired him and cleared his path of career. By the age of 16, he developed patriotism, and thinking over some extremely serious issues which cause Land pollution and Air pollution, he came up with new invention of generating electricity from coal ash and making the waste reusable by transforming the waste (ash) left after generation of electricity into complete damp proof compendious substance with the help of Kumar Ashutosh Rajesh who is a Demonstrator at TNB College in Bhagalpur. This came out as his 1st research paper on Utilization of coal ash, which added the tag of an author to Nikky’s name. He feels honoured to have worked in this project with his father, his idol - Mr Sunil Kumar Jha. “I dedicate all my Inventions, researches, book and all the knowledge to my father and through IUeMag, I want to express my love for my Dad, who has the highest place in my life. I owe him my whole life for being my torchbearer always,” mentions Nikky with tears of happiness in his eyes. In 2008, Nikky Jha was awarded the Paryavaran Ratna by the Indian Centre of Wildlife and Environmental Studies in South Asia region. “Being a researcher, I am aware of importance of each single creature present on this earth's crust. After looking at my love for nature and environment through my 1st research paper, one of my faculty made me aware of ICESBS. I submitted my work there and after an exam I was awarded ‘Paryavaran Ratna’ award," narrates Nikky. Hybrid cell phone charger - A charger that can charge a phone with electricity and without electricity. It uses all types of renewable resources of energy to charge the phone. Electrical crepe band - An elastic band that can cure your body and joint pain by providing soft frequency which penetrates skin and leads body to secret pain relieving hormone. He doesn’t only believe in inventing things but also in making them reach and benefit the masses. Hence he has come up with a company named Miracle Minds (www.miraclemindsbook.com). The company aims to manufacture Nikky’s inventions and introduce them to the market at low prices. “We have taken our 1st step as of now. The link to pre-order my latest invention - Electrical crepe band is open. One can pre-order all my Inventions and book from the website,” says Nikky. In 2015, Nikky, studying in 3rd year of Engineering, plans to come up with some inventions from the fields he is researching on such as Artificial Intelligence, Smart fan regulator, Nanotech, Superconductivity, Laser, Malarial mosquito detector, Crazystartups- A motivational book.